Table settings that use snowmen are among my favorite tablescapes. Why you ask? Because decorating with snowmen at Christmas time means I don’t need to take down all my Christmas decorations after the holiday-Yuck! The house always looks so bare and empty when Christmas decor comes down don’t you think? When February rolls around, all my snowmen decorations look great tucked in with my hearts and arrows for Valentine’s Day. I’ve loved the taste of cinnamon from the days of cinnamon toothpicks as a young girl. These Brach’s Cinnamon Jelly Hearts paired with marshmallow snowmen made an adorable and tasty favor at a recent brunch I designed for a client. 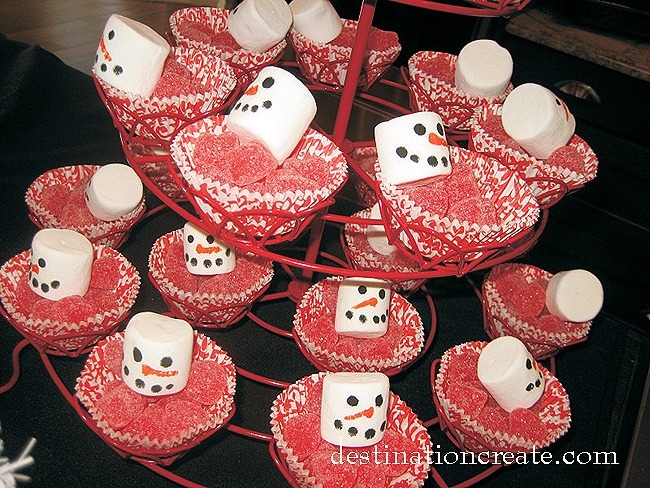 I saw the marshmallow snowmen in Phyllis Hoffman’s Celebrate Winter 2009 magazine. I simply adore this magazine! For a sweet favor at a winter or Valentine luncheon, brunch or party just prop the marshmallow snowmen inside a cupcake liner on top of a pile of cinnamon hearts or some other favorite candy. Display in a metal cupcake holder or on a tiered stand. The marshmallow snowmen are easy. Purchase food color pens in the cake decorating section of your favorite grocery or craft store and draw the faces on marshmallows. Super simple! 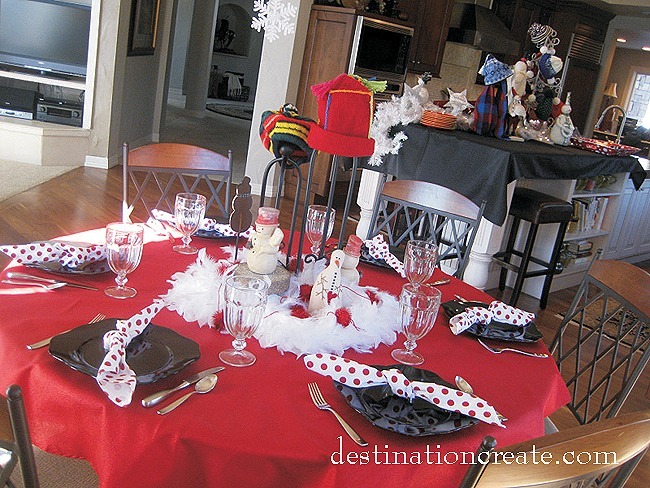 Remember to think vertical when planning your snowman table setting. What can you hang from the ceiling or light fixture? I went with snowflakes of course. For the centerpiece I used a few snowmen from my collection, a white feather boa for a snow-like effect and a red tinsel ball garland. A trip to one of my favorite thrift stores yielded a great collection of colorful knit hats and scarves. 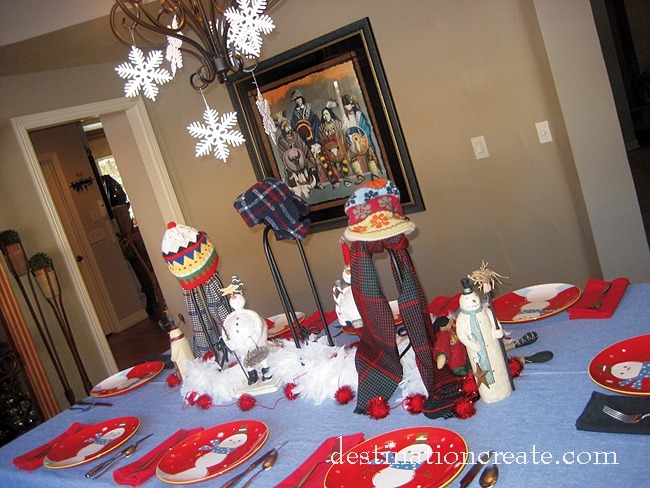 Combined with my snowman collection and adorable snowman plates found on clearance Target several years ago I created a cheerful wintry tablescape. Once again, think vertical. 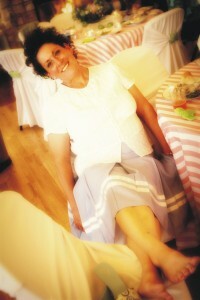 Be sure to have several different levels in your tablescape. 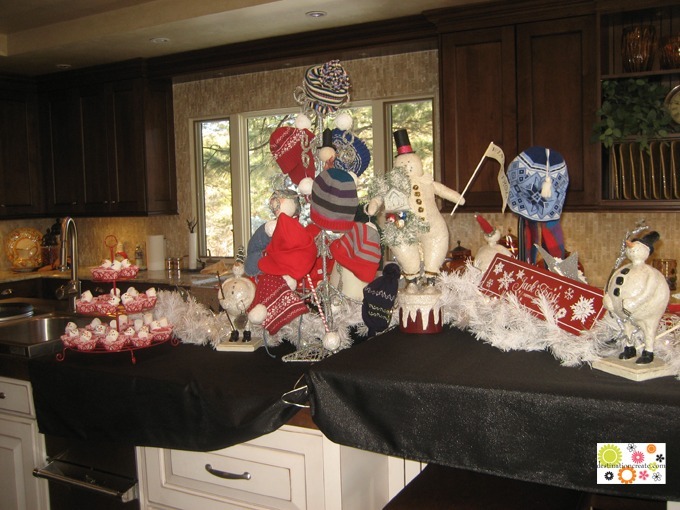 I used some black candle holders to display winter knit hats and scarves. The black table cloth makes everything POP. Once again I used my snowman collection and thrift store hats and scarves. This time I used a silver glitter-encrusted Christmas tree for visual height and interest. I created the Jack Frost vinyl sign with my Silhouette machine. Check out Hobby Lobby for seasonal blank metal and wood signs. I know, I know, Valentine’s Day has come and gone… But winter is still raging and I like to leave up cheery hearts and snowmen until it’s time to decorate for Spring. It makes my heart happy- all that red!